Our hands go through a lot during the day to day activities, and it is crucial not to disregard their importance. The health of hand and feet are commonly ignored by many. Most people know how to take care of their face, teeth, and hair but very few are aware of the significance of hand health. People notice your hands also. Being characterized as a prehensile appendage that is essential for grasping, poor blood flow through hand can seriously impair their function crippling your lifestyle. Many conditions can hamper the hand's unique blood circulation, and it is important to identify those conditions and take steps to treat, control or prevent them. When talking about hands, it is necessary to talk about forearm as a wide range of movements of hands are carried on by forearm muscles. The same goes for blood circulation. 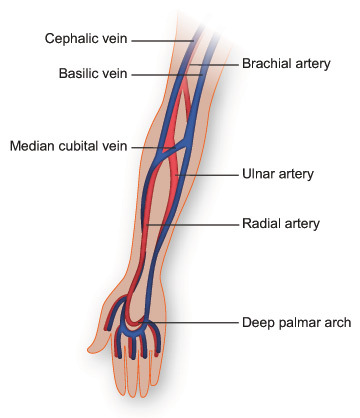 As you can see in the illustration, the forearm is supplied by a large caliber vessel named brachial artery. At your cubital fossa, (a triangular region in front of elbow joint) it divides into Ulnar and Radial arteries that supply medial and lateral sides respectively. In the hand, both arteries reconnect to form the superficial and deep palmar arches from which many small vessels including palmar digital arteries arise and oxygenate small muscles in hand. Deoxygenated (used) blood is collected by numerous small venules that drain into superficial and deep venous drainages and ultimately reaches the heart. It is necessary to have some idea about the blood supply to hand as the consequences of diminished blood flow can be hazardous. Diabetes tops this list as it is the most common disease causing circulatory inadequacy. Persistently high blood sugar levels for years can damage the inside of blood vessels (intima) leading to ‘plaque’ formation. This ‘plaque buildup’ can reduce the blood flow drastically. So people with diabetes and other hyperglycemic individuals should always keep their blood sugar in check. Substances in alcohol and smoke also damage the intima (inside) of blood vessels. It is best to stop tobacco use and consume moderate amounts of alcohol. Obesity and sedentary lifestyles. If you are obese/overweight, that means your energy intake is more than expenditure. So more energy is deposited in the body as fat. More body fat means more lipids in blood including the harmful LDL cholesterol that later clogs the vessels. B complex vitamins are well known for their circulatory enhancement capabilities. They fight anemia, reduce bad cholesterol and promote energy production. Other vitamins include Vitamin D and Vitamin C.
Muscle movements aid in circulation. Inactivity can cause slow venous drainage. These are the main contributing factors despite some other rare conditions. How to know your hands are getting enough blood? It is easy. You can do it by checking your capillary refilling time (CRT). Hold your hand above the heart level and squeeze your finger pulp until it turns white. Then release quickly. It should take less than 2 seconds. If prolonged, it may indicate sluggish blood flow. Usual symptoms include numbness, pain, cramps and tingling sensation. If you suspect circulatory insufficiency, it's better to consult a doctor for finding the underlying pathology. The first thing you should do is finding the underlying cause and controlling it. It is important to know how to improve circulation as it will make your underlying condition more manageable. Doing hand exercises using stress balls like StringyBall is an excellent way to propel sluggish columns of blood. In cold weather always wear gloves and rub your hands to keep them warm. Eating ‘right’ foods containing Vitamin B complex, Vitamin C and D is also essential. Always maintain a healthy body weight through exercise and a strict diet and get the help of a professional if needed. Smoking and heavy drinking can worsen the symptoms and will cut off the blood supply significantly causing extremely painful spasms. Another proven method that tweaks the blood flow is taking ‘contrast showers’ that includes alternating between hot and cold showers. This will elicit a pumping effect in your lymph vessels that in turn, will get the blood pumping. How will the unique StringyBall help? The revolutionary StringyBall is a modified stress ball on a string that can be tethered to your wrist or palm making it easier to carry and use. Repetitive ‘squeezing exercises’ using StringyBall will propel the blood flow swiftly in one direction. Muscles involved in squeezing, like digitorum and four flexors including the digiti minima brevis, pollicis longus, digitorum superficial and digitorum profundus will be thoroughly put to the test and stagnant blood columns especially venous blood will be returned to the heart more efficiently thus aiding overall circulation. Poor circulation causes impaired oxygenation of hand tissues that in turn produces toxic waste products. These accumulated acidic nitrogenous material contribute to the cramping hand pain common with circulatory failure. Regular repeated exercises using StringyBall squeeze ball will remove all these malevolent products thereby alleviating pain significantly. Repeated exercise will also keep the hands warm and help blood flow. StringyBall color coded balls come in three different strengths with the yellow ball having lowest density and blue with highest. All three balls can be used for enhancing circulation. 2. How is poor circulation linked with diabetes? 4. VITAMINS FOR CIRCULATION OF BLOOD – HOW DO THEY HELP?